Absolutely want to stay again! I wasn’t sure at first at it looks rather like a hotel than a hostel. I loved it ! Great location regarding public transport, great facilities and you do meet people when you use the common kitchen area. Love to return for sure. I've had a great stay here. 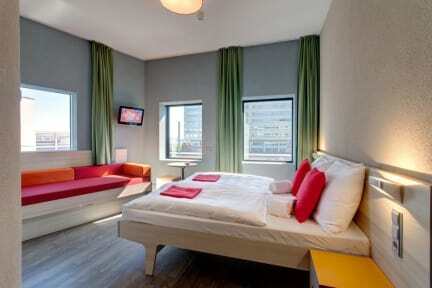 The rooms were very clean and the interior was very nice, definitely worth the prize you pay. It's located right next to the train station, so you can get to the centre in less then 15minutes. Really good! Geweldig schoon en zeer rustig (geen enkel straatrumoer oid). Muziek in de foyer was nogal k*t.
This was my first experience staying in a hostel, and it was great! They offered the option of Continental Breakfast for 7-8 Euros, you were allowed to rent towels for 1 Euro, and the rooms themselves were incredibly spacious. 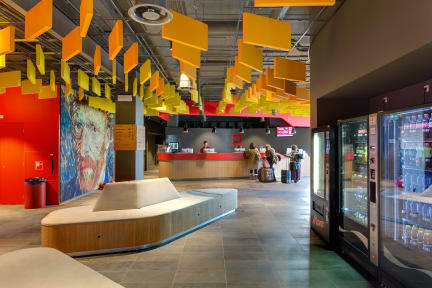 The staff was helpful in answering questions, and although the hostel is a 15 minute bus ride to central Amsterdam, it was a five minute walk from the station so it wasn't bad at all. There was a community kitchen, a nice reception area with comfy couches. Would recommend! The airconditioning system was so loud I couldn't sleep and started on 24/7.